A boy was banned from speaking at home, locked in a soiled room and fed stale food by his parents, a court has heard. 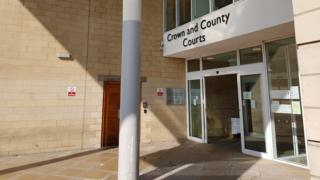 A social worker told Northampton Crown Court one of the child's siblings said they were "worried they'd be hit" if they spoke to their brother. The jury heard the child's teachers had raised concerns about him soiling himself and running away from school. A social worker described a meeting she had with the brother, who said the child was locked in a room, fed leftover food which was "sometimes days old" and had to urinate and defecate on the floor. She said: "He couldn't understand why his brother was treated differently at home and told me no child should have to experience what he experienced. "When he was allowed out of the room he was made to face the wall in the hallway for long periods of time. Nobody was allowed to speak to him." Describing the room, a Northamptonshire Police inspector who searched the home said: "The stench of excrement was overbearing and you couldn't stay in there for any period of time." Prosecutor Grace Hale previously told the trial that the child was also beaten and made to sleep next to his brother on a filthy mattress with the springs sticking out. But another social worker told the court he found no sign of a lock or alarm on the child's bedroom, and the home, in Northampton, appeared to be "spotless" when he visited.